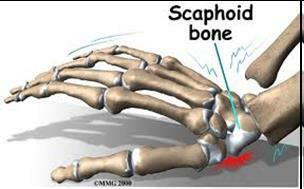 Scaphoid fractures most commonly occur as a result of a fall onto an outstretched hand. These fractures notoriously heal poorly and require quite significant immobilisation and rehabilitation following removal of the plaster cast. The Hook of Hamate fractures are almost exclusively a golfing injury, and injury to the distal end of the ulna nerve are not uncommon. HOW DOES THE PATIENT PRESENT WITH A SCAPHOID FRACTURE? The patient presents with thumb sided wrist pain following a fall onto an outstretched hand. There will be acute tenderness on palpation in the anatomical snuff box. Often, initial x-rays do not show the fracture if it is not a complete fracture of the neck of the scaphoid. The radiographer must be alert to finding the best image to view the bone to ensure the fracture is visualised. Even if the fracture cannot be seen, usually the wrist will be immobilised. The wrist is plastered in the correct position of slight wrist extension and the ability of the knuckles (the metacarpal-phalangeal joints) to fully flex. If there is limitation of finger movement, the plaster should be cut down to allow the MCP joints to move freely. After 6 weeks the wrist is re-x-rayed. If there is non or delayed union, the plaster is reapplied for a further 6 weeks. 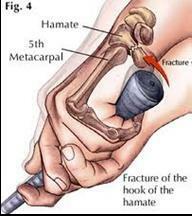 HOW DOES THE PATIENT PRESENT WITH A HOOK OF HAMATE FRACTURE? The most common history is of hitting the ground during a golf shot, with the handle of the club being forced into the palm of the left hand for a right-handed golfer during the resulting jolt. The patient presents with acute pain in the hyper-thenar eminence, and usually tingling into the 4th and 5th digit as a result of injury to the distal end of the ulna nerve that wraps around the hook of hamate. The wrist is usually put in a plaster for 6 weeks followed by a thermoplastic splint of there is delayed union. Often, however, the displaced hook has to be surgically removed to take pressure off the ulna nerve. WHAT EXERCISES ARE REQUIRED FOLLOWING PLASTER REMOVAL? Following any immobilization of the hand and wrist, there is usually loss of supination and pronation strength and range, as well as loss of intrinsic muscle strength and control. Specific physiotherapy exercises are required to address this, and the entire upper limb may also need retraining to ensure good proximal stability returns to the upper limb complex, particularly if returning to sporting activities.